MOJAVE, Calif. — A private Virgin Galactic spaceship built to carry passengers on suborbital joyrides aced its second powered test flight Thursday (Sept. 5), breaking the sound barrier as it roared through the skies here over the Mojave Desert. Virgin Galactic's SpaceShipTwo soared skyward on a column of bright orange flames and white smoke after being released from its WhiteKnightTwo mother ship. Virgin Galactic's SpaceShipTwo rises into the sky under rocket power on Sept. 5, 2013. At right is WhiteKnightTwo, the private space plane's mothership, which carried it into the sky. "This is a giant step," Branson wrote on his blog. "Our spaceship is now the highest commercial winged vehicle in history! We also successfully tested its feather system for carefree re-entry too — the first time that’s happened on a rocket-powered flight." Test pilots Mark Stucky and Clint Nichols put the six-passenger spaceship through its paces, conducting a test of the feather re-entry system for the first time in powered flight before guiding the vehicle to a safe touchdown on Runway 30 at the Mojave Air and Space Port. "SS2 has successfully completed another supersonic rocket-powered test flight! Hit our planned duration, altitude, and speed," Virgin Galactic officials announced via Twitter Thursday. The Thursday test flight, SpaceShipTwo's first powered flight since its history-making debut on April 29, was delayed about an hour as engineers worked through an issue with a faulty sensor that indicated a fuel leak. They ultimately bypassed the sensor and took off at 11:06 a.m. EDT (1506 GMT; 8:06 a.m. local time). 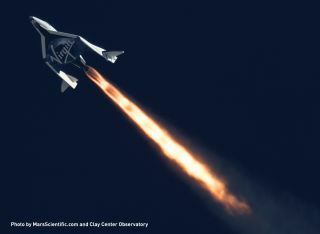 The smoke emitted by the space plane's hybrid engine was white, a noticeable difference from the black smoke of the first rocket-powered SpaceShipTwo test flight in April. The reason for the difference was not immediately clear. This test marked WhiteKnightTwo's 132nd flight, and the 29th for SpaceShipTwo. Virgin Galactic officials have said they hope to fly SpaceShipTwo on a suborbital flight to an altitude of at least 62 miles (100 kilometers) by the end of the year and begin commercial service in 2014. Approximately 625 people have put down deposits for brief suborbital flights that now cost $250,000 apiece. The company raised its ticket prices from $200,000 shortly after the successful powered flight in April. Branson has said he and his family will be on the first commercial flight. A number of celebrities, including Leonardo DiCaprio and Justin Beiber, have booked seats aboard the suborbital tourism vehicle. Stucky and Nichols are test pilots for Scaled Composites, which built SpaceShipTwo as well as the vehicle's predecessor, SpaceShipOne. SpaceShipOne won the $10 million Ansari X Prize in 2004 by becoming the first commercial craft to fly people to space and back twice in the space of a week.